This topic is extremely difficult for me to write about. In fact it’s just as hard for me to talk about because as a general rule I am in denial about my own self harming behaviours. For this reason I have written this blog article slowly adding a little bit each day as I confront the reality of my own self harming behaviours. I write the article because I was asked to by a reader and so I believe you, my audience, have an interest in this side of bipolar disorder and I want to try to be honest and share my experiences with you. I hope that you don’t judge me for what I am about to share. I also implore you not to undertake any of these behaviours, please don’t. I self harm in any Bipolar State, Depressive, Manic or Mixed. I don’t always self harm though, not every time I’m unwell, probably only 50% of the time I am unwell. And it is not always regular or repetitive, sometimes it is just a once off, on a really bad emotional day. The types of self harming behaviours I engage in are fairly basic, not very creative. I cut myself, I overdose, I poison myself, burn myself, starve myself, chain smoke and in one long lasting manic episode I exercised to extreme lengths in order to feel pain. I will talk about each of these individually now. This was probably the first self harming behaviour I ever engaged in. I’m fairly sure I learned to do it from reading about it in books and seeing it in movies or on TV shows. I had a difficult childhood and in my early teens I began cutting because I found it alleviated my anxiety and suppressed my anger. I have been doing it off and on ever since. I am not covered in scars though, I always cut in the same places so I only have a few scars and they are in spots you wouldn’t notice them. This is probably reflective of the fact that I also have obsessive compulsive disorder. I wouldn’t say I’m a bad cutter, I rarely do it these days, the reason for that is that my husband would see the cuts and it would hurt him to know I am hurting myself, so I choose other ways of self harming that don’t leave a trail per se. I have also never cut as an attempt at suicide, I know the rates of success are low and for that reason I have never tried. This one is my most dangerous, most tempting and most frequent form of self harming behaviour. In fact I am so tempted by it that my husband now has a safe in our house where he keeps my medications. A safe that only he knows the code for, so that I cannot access any drugs in order to overdose. In the old days however I used to overdose regularly. Not knowing how much of a drug would kill me, and not really caring, I would just take whatever I could get my hands on. It has landed me in hospital on a number of occasions and I have then been transported straight from the emergency ward into the psychiatric ward for care. Mostly I am not overdosing in order to kill myself (although usually I wouldn’t mind if that was a side effect), I am really doing it for the physical and emotional feelings that come from too much of certain medications. For example, endone, which when you overdose on it makes you extremely lethargic and relaxed, it gives me a deep sense of relief, like all my troubles are a long way away, I am numb. You can’t really think about anything because your mind is swimming in emptiness, a feeling I really enjoy. Another favourite (as strange a word as that is to use in this context) is of course valium, which gives you a similar mind altering effect but isn’t as good at relaxing your body. It sounds like I’m selling the idea of overdosing on these medications so I will stop now. It is very dangerous, you shouldn’t do it, but I am a hypocrite in saying that. Apart from the fact that they are locked away so I can’t access them, I also have chosen not to continue this behaviour and am working on it with my psychiatrist and with my husbands help, but this is a recent development and my emotions surrounding the topic are still raw and inconsistent. This is a behaviour that I trialled in high school. Drinking or ingesting poisonous substances like butane. I found that I felt sick more than I felt relief, which is the emotion I am striving for when self harming and so I did not continue it for very long. I tried a whole range of things, which I won’t list here, but they all made me very ill, ending up in hospital a number of times and didn’t make me feel any better emotionally, so I stopped. This has been a recent development in my self harming repertoire and occurred while I was manic. 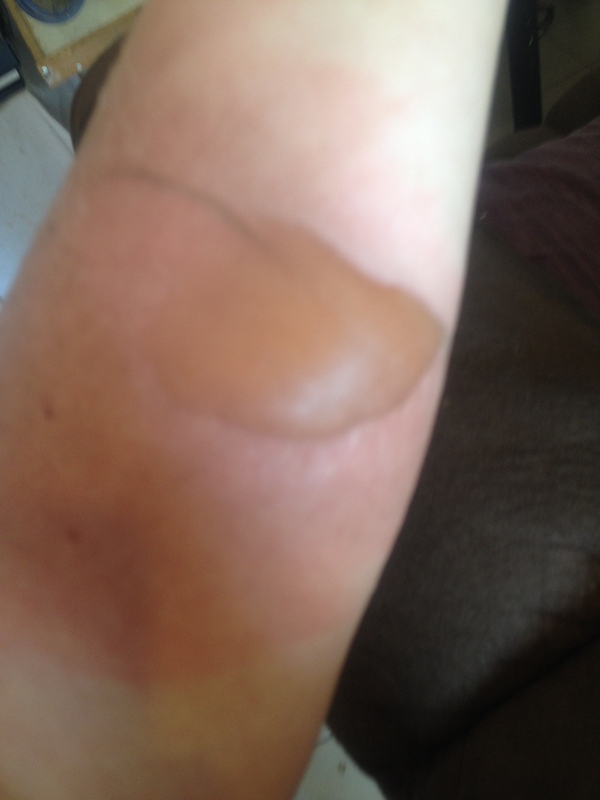 I poured boiling water over my arm – you can see the result in the picture. In reality I think it was a cry for help, it was a way to get attention and ultimately to show my husband that I really wasn’t coping. When I first did it I was actually in total denial and told him (and myself) that it had been an accident, it took more than a week for me to admit I had done it on purpose. I would like to say I won’t do it again but the pain I experienced from it both physically and mentally really cut through my mania and grounded me. I am scared that in a manic state I could turn to this again to bring myself down. I need to discuss this further with my psychiatrist now that I am getting close to being well, so that we can put an action plan in place to stop me repeating this behaviour. Ever since I was a teenager I have had trouble with eating a regular diet. When I am unwell (in a bipolar related way) I tend not to eat at all (that is I drink fluids but I don’t eat any solid foods). This is the state I am currently in. I simply have no appetite for food and if I do eat I throw it up after almost every time and I can only manage a few bites at most anyway. I can drink though and I do (not alcohol) but I can’t face food. And the physical feeling of hunger, hunger pains, actually make me feel better. I am overweight and the pain of hunger makes me feel like I am going to lose weight and consequently I like the pain. I have written another article about how I nourish myself when I am in this state and you can read that here. I can’t say for sure that I smoke because I’m bipolar, but I can say with certainty that I still smoke because I’m bipolar. I think that my care factor about the health risks of smoking is low because my desire to live is low, sometimes very low. I especially do not want to grow old. Furthermore, if I try to quit, which I have done on a number of occasions (under duress and because of pressure from any number of people), I find myself slipping into a depression or at the very least a mixed state and I have to stop trying to quit in order to regain my psychological health. So the question remains what is more important my physical health or my psychological health and depending on who I ask depends on the answer I get, but at the end of the day it is my choice and, well, I’m still smoking. This has only happened once for me, a few years ago before I was diagnosed with Bipolar. I had a manic phase that lasted for months. During that time I began exercising VERY regularly and pushing myself to the point of exhaustion and beyond. I would literally exercise till I threw up or collapsed in a heap, and I was doing it because I wanted to feel the pain. I was so driven to exercise that every other part of my life suffered and it was the worst manic phase I have ever experienced. On the upside I was extremely fit, but I can’t say I was healthy, pushing myself that hard and not nourishing my body in order that it could do what I was asking it to do, it was very dangerous. There is a part of me that wishes I would have another manic phase like that so that I could exercise with ease (psychologically) again in order to lose the weight I am carrying, but I know it would be unhealthy. So those are the main self harming behaviours I have partaken in. I hope that by sharing these with you I have helped someone in some way, maybe made them feel less isolated and alone, and I reiterate again PLEASE do not copy any of these behaviours they are all terrible and dangerous and stupid. Until next time, EmJ. Thanks so much for writing about this. It is very courageous of you. I really wanted to ask you about this, but didn’t know of a sensitive way to ask. I found this topic impossible to bring up with my friend and when she did talk about it I was afraid of responding in the wrong way. What have you found to be a helpful/compassionate way to respond? Please see the information in this article. You can find me as buenavida1 in Facebook and Twitter.